Students have to carry out scientific enquiry in the context of their discovering and exploring of an environment. Pairs of 11-12 year olds explored a woodland and were presented at certain times with different forms of digital augmentations. Students can send SMS that appears on lecturers laptop during the class. They can anonymously ask questions without interrupting the class. The lecturer can choose to respond immediately or wait until a number of questions arise. SMS are available after class. 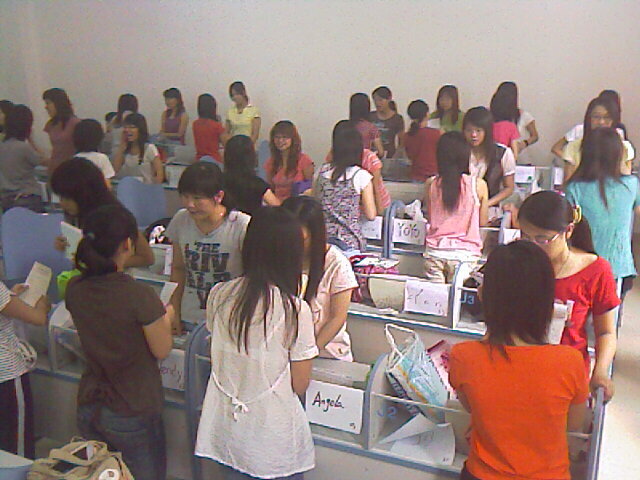 Students in a economics course could acess course mateiral (slides, PDF) and contribute on the discusstion board. Composition students were asked to compose and perform music on PDAs. PDAs are equipped with MIDI module and portable keyboard. Evaluate to what extent and how a PDA can help students learning. PDAs are issued for the project time with the aim of collectiing application log data. Learn more about how students use PDAs. The project aims to test “just-in-time” access to knowledge on mobile terminals for medical students. Especially when they are practicing in medical institutions. Medical practitioners on ward are equiped with PDAs to build a portfolio of evidence. A detailed evidence of clinical activities, prior learning comopetencies, course materials, certificates. Furthermore they get acess to learning resources, clinical guidelines and a learning diary. Informatics students were required to develop and eavluate their own interactive learning experiences in collaboration with fellow students. 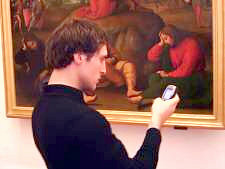 PDAs with internet functionality were lent to them to consider as their own. Course materials were distriubted in e-book format. Followed by an investigation how students use these learning materials. A collaborative treasure hunt game that requires co-ordination between spatially seperated team-members. The teams have to visit locations in an urban area to collect symbols in order to complete tasks. A collaborative problem solving application that attempts to support learners in constructing their own understanding of tshare their decisions with fellows. A application for percussion composition, allows users to create, manipulate, edit and save original pieces of percussion music through an intuitive interface. Children collect with scientific data on spot. Devices can collect data and communicate with sensors that are in the field while also providing instant feedback through on the spot data analysis. This project supports the participants in expressing their thoughts through a digital narrative. While the overall process is similar to other digital film projects, the tools used are different. The learners shoot all of their footage and record their soundtrack on smartphones. In addition, the smartphones allow the participants to make their multimedia available to collaborators by sending the images and sound via the multimedia messaging service (MMS) to a blog. 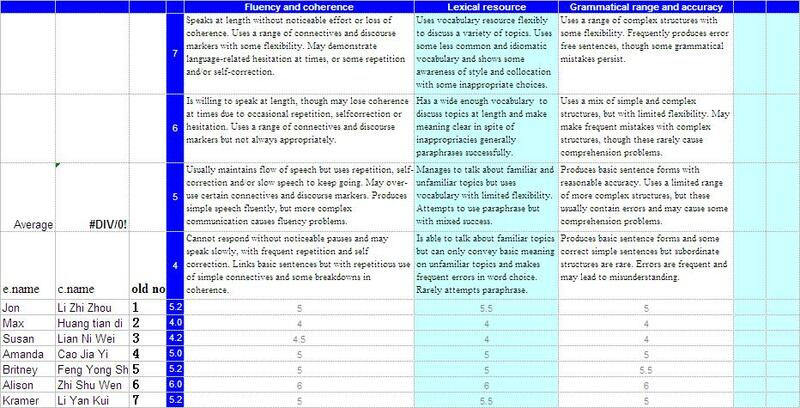 >Vocabulary review schedule – Can it work? > In the past, some teachers recommended a way to systematically review vocabulary based on a schedule where the time intervals of review would become longer and longer. I tried to figure out what that would be like for the student. If a student ‘learned’ 20 words on Day 1, reviewed them the next day, then 3 days after that, 1 week after that, 2 weeks after that, 1 month after that, 2 months after that, then here is how many words the student would have to review daily. We assume the student starts his project on Day 1 and everyday adds 20 words. If my calculations are correct, if the student stopped reviewing a word because he knew it on Day 118 (after about 4 months), then his vocabulary review load would level off at 140 words a day. By the time he is supposed to know the word (after 117 days) he will have reviewed the word 7 times. He will be learning new words at a rate of about 600 a month which would be more than 6000 per year. We have to acknowledge that this would be only a passive understanding of the word, perhaps useful for reading/listening. But it could provide an ‘introduction’ to the word that through further contact with the word in extensive English input could turn into an active understanding of the word useful in writing/speaking. I think such a thing would be doable but only by highly dedicated well-organized students. For most students it would probably be too challenging. Perhaps if the student limited himself to 10 or even 5 words a day it would be easier and he’d only have to review 70 or 35 words a day. Would reviewing the word 7 times be enough to hold onto it and allow extensive exposure to kick in and help the student keep the word I don’t know. >Sometimes a few sharp students will answer all the questions I put to the class while some students want to space out, read or chat. To force total class participation I ask all the students to stand up. Then when I put a big question to them like “Give me some words about [whatever the subject we’re studying].” Each student who replies with a satisfactory word can sit down. In this way everyone has to participate. > Yesterday, I did a speaking test for 200 students. It’s quite a big job and took me all day. But it would have taken much longer if I had never done this before and if I wasn’t organized. Some teachers allow students to choose their partner and choose their subject. Sometimes they can do this days in advance. Consequently, some students will find a dialog and memorize it and then perform it for the test. I don’t do it this way. I don’t think it’s very realistic. In the workplace, people need to be able to speak English to anyone and they can’t always choose the topic. So I tell my students they can choose any partner they want as long as student #1 chooses students #2 and student #3 chooses student #4, etc. I tell them they can choose their own topics to talk about. They come up to my desk and choose from several slips of paper which are facing down. The students cannot look at the paper before they choose. Consequently, they are choosing randomly. I do allow them 3-4 minutes to prepare before the interview. The topics are always things that we practiced discussing in class. When one pair of students sits down to do their dialog for me another pair of students will come up to the desk, choose a topic and stand aside to prepare. I don’t allow them to use dictionaries, notebooks, textbooks or to talk with other students during the preparation period. I sit facing the two students who are talking but behind them I can keep an eye on the next two students who are preparing for their talk. This is important because they many of them can hardly keep themselves from a bit of cheating if it is possible. 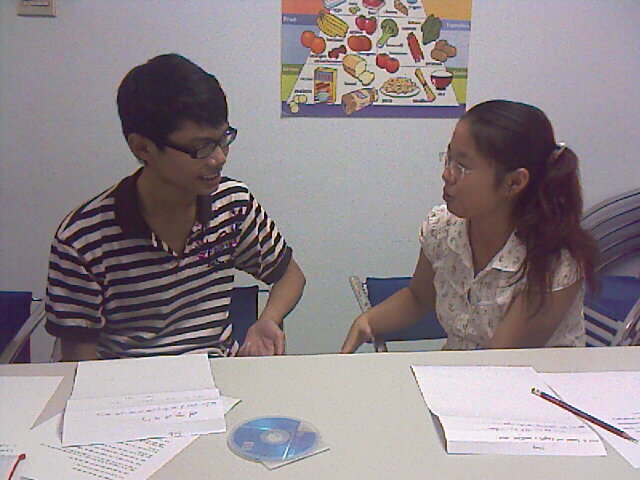 The students talk to their partner on the topic. I used to be an IELTS examiner and found it is a bit extra work to have to also be asking the students all the questions. So I like to get the students talking with each other and I listen in. If I think a student can go higher or if their dialog was too short I will jump in with a few extra questions. While they are talking I am recording them. They hold a cheap $2 clip-on microphone that I found which works really well and is fastened at the end of a ballpoint pen. 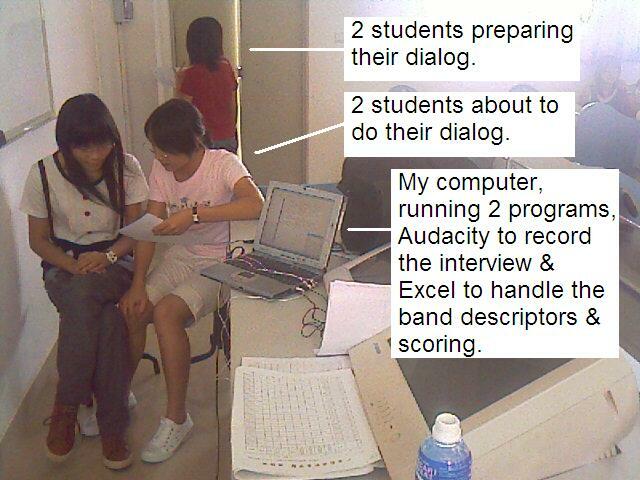 I use free program called Audacity to record the interview. Although I’m sitting right next to them, I actually listen to the students through a set of earphones. This ensures that everything is being recorded. The interview is recorded for reference in case I want or need to go back and check something or if I need to justify a score I have given. If their dialog is too short or doesn’t reveal their English skills well enough I will ask some questions to make them speak more. Answering”why” questions or questions where they have to explain or justify a viewpoint are some of the toughest questions and are good to push students to the limits. I have some band descriptors and a list of all the students names and numbers on an Excel sheet. The band descriptors are divided into three areas of speaking (communicative range, overall fluency, accuracy & appropriacy) and four levels (levels 4-7 of a 10 level rating system) While they are talking, I scan the band descriptors and give them an initial score. I continue to listen to them and modify parts of my score as they perform better or worse. It’s very important to have a clear set of standards that the students should speak to. And while they are speaking you should be constantly checking those standards and try to measure the student to those standards as best you can. After all of the testing is done, I will use Excel to average out the band scores and assign grades on a curve.